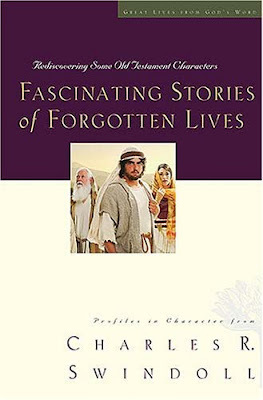 Fascinating Stories of Forgotten Lives is the next-to-last book in Charles Swindoll's Great Lives series which I have been reading this year. My goal was to read one title a month (taking off the summer months) and complete the series by the end of this year. I've almost accomplished that (being in the middle of reading Jesus: The Greatest Life of All at the present moment.) I have, however, decided not to "review" or share my thoughts on Jesus because exactly how would I do that? "What I learned from Jesus" just doesn't seem to be a topic one could narrow down sufficiently to fit into a piddly book review so I'm not even going to try. I will therefore conclude my discussions of this series with Forgotten Lives although I don't really think that they are quite so forgotten as much as perhaps they are just not talked about a great deal. I think for the purpose of this post I'm going to limit myself to talking about Cain and what Swindoll pulls from his life as a lesson to us all. In a day and age where "anything goes" to the point where Christians are persuaded that sincerity is it's own virtue, Swindoll takes the time to remind his readers that God is holy and God is just. Obedience is required over sincerity - for a human can be sincerely wrong. It is important to know Who God Is and what He requires and desires. Because what He wants is much more important than what I want. ""There are many paths to God," some say, "so no particular belief is 'right' or 'wrong,' so long as you sincerely seek Him." And that, according to Scripture, is sincerely wrong! Sincerely place your trust in any means, or any person, other than Jesus Christ who shed His blood for our sins, and God will not receive you . . . sincerely (see John 14:6 and Acts 4:12). If that sounds harsh, let me offer two perspectives for your consideration. First, the Lord is loving and kind, but He is also just. He is a very discriminating heavenly Father who has been specific in how we are to come to Him, but He could not have made that way any less complicated. He provides the free gift of salvation, paid for by the death and resurrection of His Son, Jesus Christ, and has left nothing for us to pay. He's done everything that needs to be done, leaving us no requirement but one: receive the gift. That's about as harsh as a billionaire demanding that you allow him to give you all of his money. Grace abounds. What we desire or think should be is ultimately of no consequence. If we say that we believe God, then, again, we must know Him to know what He requires of us. And what is one main thing that is required? To believe. I really think that summarizes why I read, actually. I get asked a lot, "How do you find the time to read so much?" Honestly, I don't think I can afford to take the time not to read. In reading scripture I learn more of Who God is directly. In reading commentaries and books on the Christian faith, I learn better how to correctly and accurately apply scriptural truths to my life. By learning (it is a process and a learning curve I still grapple with!) to be more discerning with the books I pick up, I find my thoughts tested and examined both by the scriptures and by men and women who strive to serve and love God with their whole hearts, bodies and minds. I benefit from the lessons that the authors I have read have already learned and are eager to pass along to all of us. How can we not read? How can we not read His word? Why do we so easily dismiss it? Why do we walk away from the hard passages and pretend they don't exist? Why do we try to not learn as much as we can about God so that we can go about in whatever manner we like and think to ourselves that ignorance will pardon us? We are half-hearted in our faith - picking out that which we do not like and building thrones for whatever part we do like (i..e, up with grace, down with consequences of sin). We build pedestals for everything and everyone but God. And when we do that, we will understand Him less and we risk the danger of approaching Him in the same manner that Cain did - with a lack of understanding and a spirit of self-love that will be to our detriment. I am a sinner. Yes indeed I am! I make mistakes. I forget what God likes and what He expects of me. I make excuses as to why I "can't possibly" meet His expectations. But those are the moments when I most need to say, "Lord, I believe. Help my unbelief and teach me to walk in Your ways." He will meet me there. Why should I doubt it? I have no reason to. He always has. Yes, this has been a beneficial series for me to read and I honestly thank God that He led Charles Swindoll to write them. If you haven't had a chance to read any of the books in the Great Lives series, I would urge you to do so. It honestly doesn't matter which title you pick up because there is plenty to learn from any of them. They are definitely not a waste of time. My only prayer is that they'll stick with me, long after the books covers have been closed. It has definitely been worth the time investment! I think I'll look for these, Carrie. Thanks for the encouragement! Now I'm off to read my Bible! I love the three quoted paragraphs in the middle especially. Every time you post about one of these books I like what you have to say. I think it's time that I did something about it and get one! How "heavy" of a read are these? I tend to be good at beginning nonfiction, but terrible at completing the book. Pathetic, I know. Annette - Not really heavy at all. Heavy on practicality and plain speech. Not heavy like a doctrinal treatise or something along those lines. If I had to pick two words I would say: very practical. Just don't tell yourself you are reading the whole series. =D Pick one and deal with that one. Then decide on the rest! I sure appreciate your reviews of these! I especially love your focus on sincerity just not cutting it--salvation is through Christ alone. Excellent thoughts again! Thank you for posting the reviews on this series! I really need to read them. At one time, I owned several of the books but I'm not sure what happened to them. I know the library carries them, though.